The royal family; an age-old British tradition and a fascination to many across the world. Many of us flick through the glossy pages of magazines, gazing at the beautifully fitted designer dresses of the Princesses and the Queen, the decorated jackets of the Princes and of course the majestic palaces located up and down the country, with regal furnishings, gilded gates, high windows and stunning architecture, spanning thousands of square feet. Buckingham Palace alone is 77,000 square feet. All of this may seem like a world away and reserved for those born into positions within the royal family, but that’s not the case. You can now sleep in a palace, without having all the pressures that come with being a royal. These are some of the regal properties you could be staying the next time you feel like holidaying like a royal. This breath-taking castle is located in the South East of Duns, in the eastern Scottish Borders. It has belonged to the same family for almost 600 years and it was built in 1785. The regal property now remains a private family house, ready for rental. It has been restored and continually maintained to a very high level and every original feature has been maintained. On entering the castle, you will find yourself in a stone-flagged Stair Hall, with twin stone staircases and as you explore you’ll find a dining room with a great oak table, that can seat up to 24 people. The dining room is home to many comfortable chairs and a small piano in the corner. Plus, the Morning Room comes with two large, crystal chandeliers. Perfect for anyone looking to holiday like a royal. 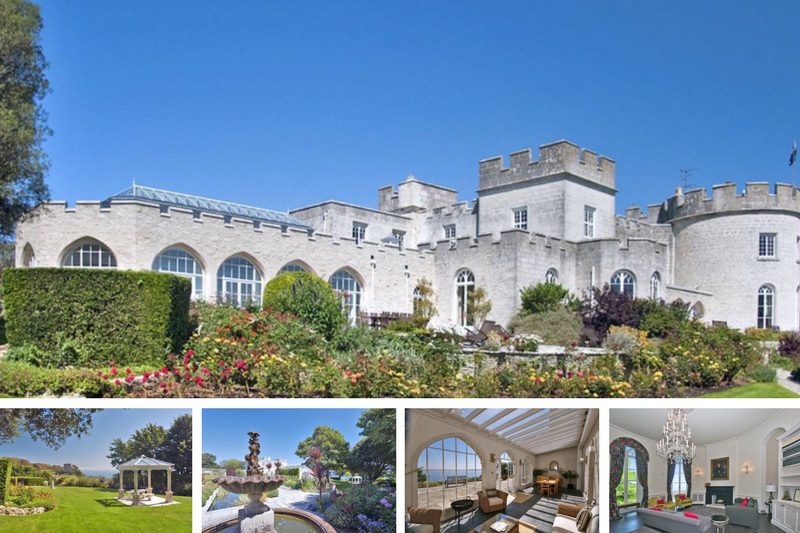 This modern castle gives you the feel of royalty while maintaining a highly contemporary style. You can find it in Dorset and it is both luxurious and stunningly beautiful. Each room brags of a beautifully crafted chandelier and the blue, British Channel can be seen close by. The actual building was built over 200 years ago and there are many elegant sitting rooms, with an open fire for you to enjoy an evening of reading next to a roaring fire. Outside you’ll find gardens brimming with colourful wildflowers and a private waterfall on the grounds (just what you need for a regal selfie!) Plus, it’s all in walking distance to Easton, with plenty of restaurants and cafes. When the words royal castle come to mind this is probably the type of property you think of. An impressive 17th-century castle, and a Grade II listed building in the Northern Somerset countryside. It’s perched on top of a hill and gives guests a 360-degree view of the surrounding countryside. The magnificent rounded turrets and faded grey stone exterior make it look as though it has been plucked from a fairy tale. You can even try your hand at archery on the castle grounds, or enjoy one of the large stone fireplaces inside. Many have found it so breath-taking that it has been the setting for several weddings. But it’s also the perfect place to holiday like a royal, while exploring all that Somerset has to offer. A magnificent and majestic gem in the heart of Northern Wales. This castle is also a grade II listed building and it has recently been lovingly restored into a one-of-a-kind holiday home. This is the perfect place to stay if you have a passion for history. The building was once home to the Mostyns (hence the name) one of the most powerful families in the history of Wales. It was later a home for Nuns for many years. The property boasts a lavish and elegant design. 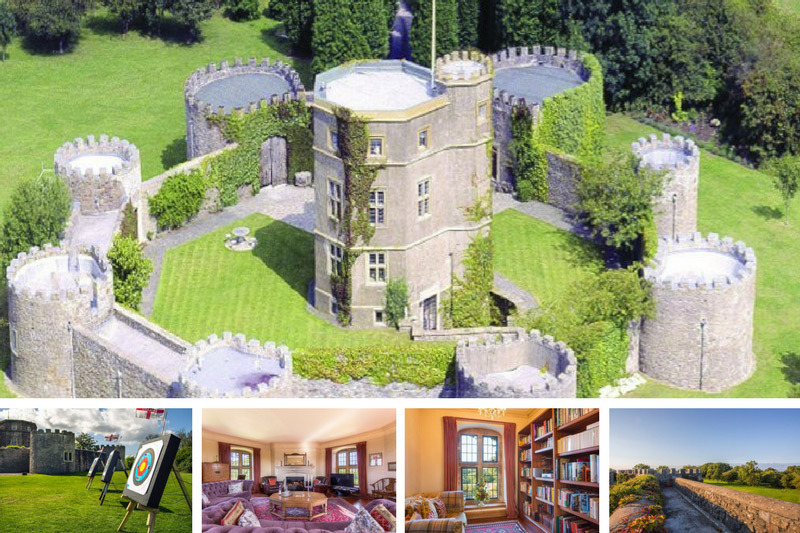 Mostyn Castle can accommodate up to 24 guests and if you’re a book lover you’ll be happy to know this castle comes with its own library and there are two drawing rooms, perfect for you next regal getaway. 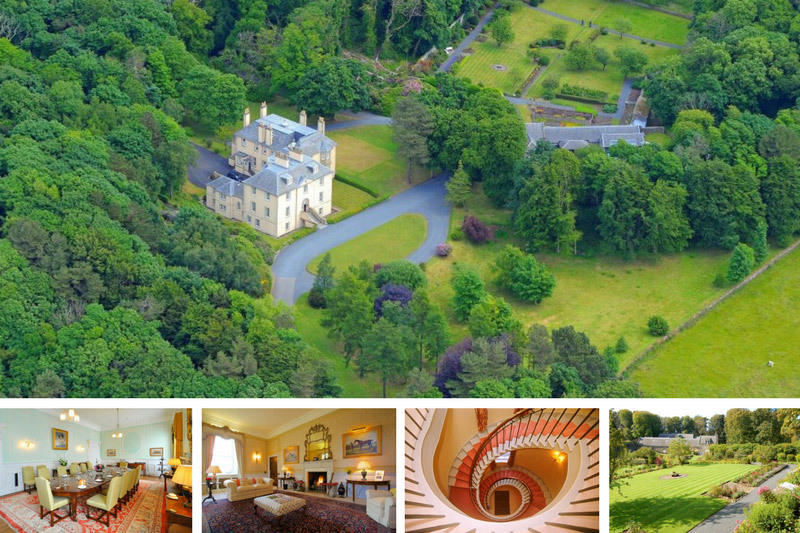 This luxurious property is the epitome of magnificence, just half an hour from Glasgow. 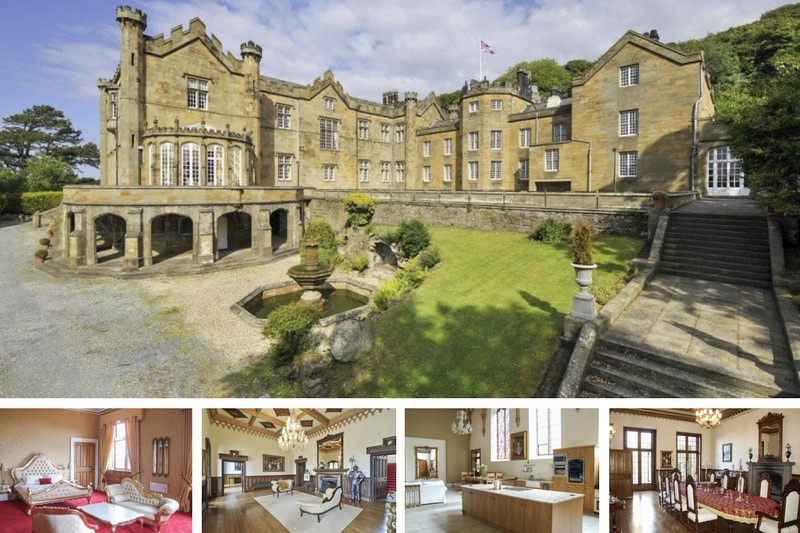 It may not be a castle, but this manor house oozes class. It was built in 1780 and the Georgian mansion has recently been refurbished to the highest standards. Not only does it come decked out with the usual majestic furnishings, but this property has more than regal design and idyllic surroundings. Just ten minutes away you will find three Open Championship golf courses and within the property, you’ll find a spa treatment room where you can find a fantastic array of relaxing offers including massages and pedicures. So, polish the crown and head off on a right regal getaway! 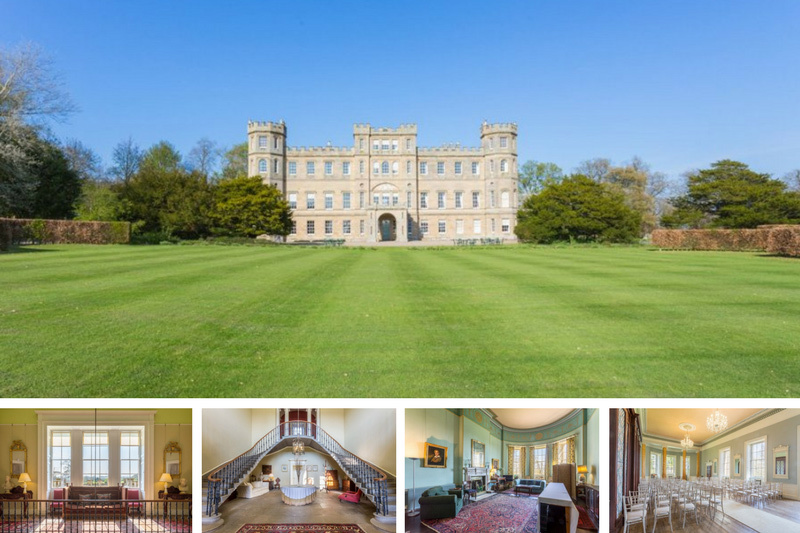 Why not take a look at some of out other royal properties across the country.